This package contains one pair of adult defibrillation pads for use with the Lifeline VIEW AED. These pads are for adult use only (8 years or older). Pads should be stored connected to the AED. Extra pads can be stored in the available carrying case. Pad package has a two-year shelf life. This package contains one pair of child/infant defibrillation pads for use with the Lifeline VIEW AED. These pads should be used on patients less than 8 years old. Pads should be stored connected to the AED or in the available carrying case. Pad package has a two-year shelf life. Use Child/Infant Electrode Pads only with software version 1.203 or later. 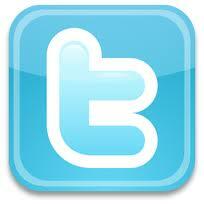 For instructions on how to verify your software version please click here. Information on software updates can be obtained from your AED sales location or by contacting Defibtech customer service at 866-333-4241. 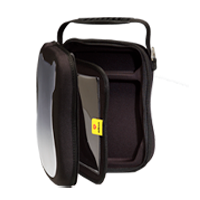 This carrying case is designed to hold a Lifeline VIEW AED, extra set of pads, an extra battery, and other accessories as needed. 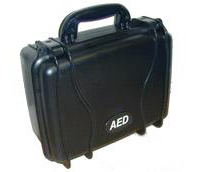 The case is made of ballistic nylon, has a carrying handle, a clear front panel for easy visibility and a secondary storage area behind the AED. 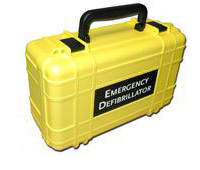 This case is designed to hold a Trainer AED and accessories. The case is made of ballistic nylon and has a durable carrying handle. The distinctive red color matches the color of the Trainer AED and together with the embroidered “Trainer” label clearly indicates that the unit inside is a training device that cannot be used to defibrillate a real patient. This case is made of tough high-impact ABS plastic. The foam insert is resistant to body fluids, and is specifically designed for the Lifeline AED. Ideal for police cars, fire and EMS vehicles, marine use, or anywhere your Lifeline AED needs extra protection in harsh environments. Dimensions: 17″ x 10″ x 6.5″. This case is made of tough high-impact ABS plastic. The foam insert is resistant to body fluids, and is specifically designed for the Lifeline AED. Ideal for police cars, fire and EMS vehicles, marine use, or anywhere your Lifeline AED needs extra protection in harsh environments. Dimensions: 15″ x 12.5″ x 7″. This cabinet allows a Lifeline AED to be mounted on a wall to increase visibility and to protect the AED from theft or damage. Dimensions: 18″x18″x4″. This cabinet allows a Lifeline AED to be mounted on a wall to increase visibility and to protect the AED from theft or damage. A loud alarm will sound whenever the cabinet is opened. Dimensions: 18″x18″x4″. This bracket is made of black metal and designed to be mounted to a wall for easy access. Dimensions: 9″ x 9″ x 6″. Lettering is 1″ high. 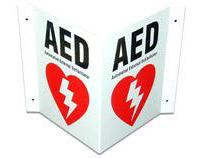 AED 2-way wall-sign for placement near your AED. Dimensions: 10″ x 7 ” with 1″ mounting flap. 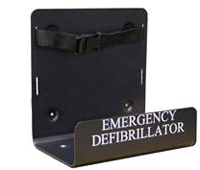 AED 3-way wall-sign for placement near your AED. Dimensions: 8″ x 10″ with 1″ mounting flaps. 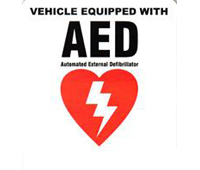 Let others know that there is an AED in your vehicle. This high quality decal is for placement on the outside of the vehicle.